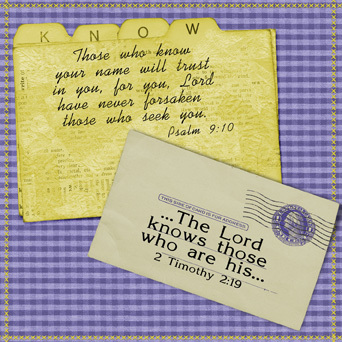 For this fortnight Patter has given us the word "Know" for our Scripture Challenge. In her devotional thoughts she shared about both sides of us needing to know God and the fact that God knows us intimately - closer than our husbands, children, parents. He knows us even though we fail him and yet He loves us with the greatest love possible. So the two verses I chose to use show both side of the "knowing" - us knowing and seeking God and His knowing those who believe in Him.